I’ve been having a lot of fun with this formerly-busted Gaggia Espresso (a precursor of their Classic and other newer models of espresso machines) that I found at the dump. We’re lucky that the Chittenden Solid Waste District here in Burlington has a “ReUse Zone” at every drop-off center, meaning that people can drop off serviceable items they no longer want without them entering the waste stream. Well, this one wasn’t quite serviceable. In fact, it didn’t work at all. But I figured that I’d either be able to fix it (in which case I’d have a fairly expensive real espresso maker for free) or I would learn something from the experience. In the end, it’s been both. I’m planning to write about the initial tear-down where I took the whole thing apart, assessed the damage, de-scaled the boiler, cleaned all the valves, fabricated a wrench to fit the slot in a screw I couldn’t remove, and got it all working–but that’s for another day. Suffice it to say that I got it working, and that a real espresso machine (with a high-pressure pump) produces drinks of dramatically higher quality than those my old Krups steam-boiler made. But this morning, no joy. The machine turned on but wouldn’t heat. I let it sit for a while, but nothing happened. Well… it was free when I found it, and it’s out of warranty, so I might as well try to learn from it! Let’s talk about how to test the thermostat and thermal fuse. There’s an excellent page about the Gaggia Classic at Whole Latte Love, and I’ve learned a lot from reading their thoughts about how to diagnose problems. They also have a whole page on replacing thermal fusible links, which I found helpful. After unplugging the unit and waiting a while to make sure everything was cold, I opened up the top cover and started looking around. No obvious damage in there, which seems like it supports the theory that there’s a problem with either the brew thermostat or the thermal fuse. 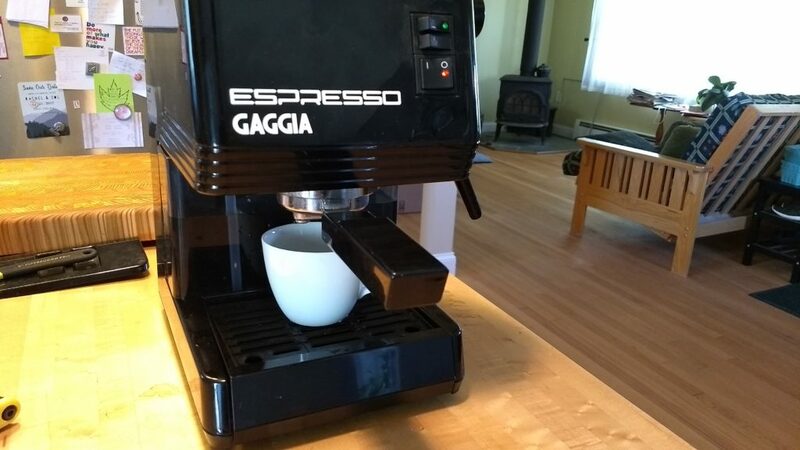 The Gaggia machines have a simple passive thermostat module that’s basically a low-pass filter for current: it acts as a closed circuit (passes current) below a certain threshold and then it opens when the temperature rises above the setpoint. This repeats on an ongoing basis, cutting and restoring power to the boiler, maintaining a relatively steady temperature. The Gaggia machines also have a sacrificial element built into the boiler that arrests a runaway heating situation before a fire can result. This is called a thermal fuse or thermal fusible link, and it’s basically just like a regular fuse except that it clamps down because of excess heat rather than excess current. The Gaggia one is designed to fuse at 184º C, well above the routine operating temperature of the boiler. If the thermal fuse is working, it should pass current… but it doesn’t. Problem found. You can buy replacement fuses from Whole Latte Love and a few other places that specialize in espresso makers, but they’re $8 each plus shipping for a single piece. I like fixing things and I have a bunch of appliances that use these components, so I decided the order a selection of 85 thermal fuses for $18 instead. That’ll give me some spares as well as other values for other appliances. When you replace a burned-out component, you always have to ask: why did this burn out? What went wrong? This is a protection component–what was it protecting me from? From my reading, these components often burn out on older Gaggia machines if they’re left on for too long, and the damage can happen long before the fuse burns out. I don’t know this machine’s history, but given that the inside of the boiler looked like it never received any descaling maintenance, I wouldn’t be surprised to learn that the previous owner wasn’t careful about turning the machine off. We’ll see. This is part of why I’m buying a few extra thermal fuses, too–so that if it dies again, I have some backups to keep experimenting.